Personally, I find this image lively and audacious. The late film director Daryl Dukes would have been fully aware of the resonance of his metaphor – both its persuasive power and its ironies. The concept of a centre to the universe – the “world navel” or “axis mundi” – is an ancient one, and the concept of a centre to our world placed firmly upon ourselves is evident in any survey of world maps. Our students are probably already starting to recognize how naively we can be egocentric, ethnocentric, and so forth – with the full human array of self-centred biases in our perspectives on the world. A lot of our students are also actively taking and sharing photos, and could appropriately reflect on their own roles and potential impact. Give students access to the mini-poster either as postcard-sized printouts or as an electronic image projected and shared. It’s possible that you could prompt student discussion down many possible lines of thought, depending on when you treat it in context of your own sequencing of TOK course ideas. If you find this discussion outline useful, feel free to download a handout copy for classroom use at the end of this post. 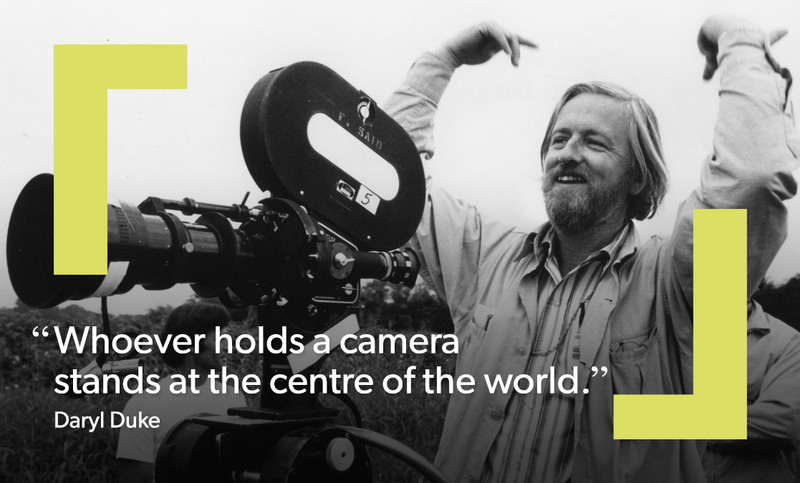 What do you think that filmmaker Daryl Duke means by his quoted assertion, with its metaphor? In what ways would you agree with him? In what ways would you disagree with him? In what ways do filmmakers or photographers “stand at the centre” in the sense of imposing control on the raw material of what they observe, from their own vantage points? Taking the camera literally, can you think of ways in which they don’t just neutrally record what they see but actively create their versions in the choices they make? In the metaphor, could “paintbrush” or “pen/keyboard” be substituted meaningfully for “camera” for creative artists in other art forms that give representations of the world? In what ways is the quotation about communicating a particular vision or story, from one spot to the whole rest of the world? In what ways could the camera be argued to be the most powerful contemporary tool for communication in the news media? When is it particularly effective? How do images interact with language in communicating the news? In what ways is the quotation essentially about perspectives on the world? How many cameras are there, and how many centres? How have the mass ownership of digital media (including video) and participation in social media changed the nature of news reports? What ethical responsibility comes with taking photos and sharing them oneself? How have cameras – or, more broadly, visual imaging – changed methods of creating and communicating knowledge within this century? How do areas of knowledge use images in ways different from the last century? In what ways do perspectives affect the way knowledge is directed, created, evaluated, and communicated – for example in interpretations in history and in theoretical explanations within the natural and human sciences? In what ways does the person or the group that holds the camera – the means and choices of recording and communicating – influence what the rest of the world knows? For further treatment of perspectives and representation, with analysis and activities, have a look at the TOK course book: Theory of Knowledge (OUP 2013).